If there is a series of superhero movies with a more inconsistent timeline than the X-Men films, I’d love to see it. After six films with five different directors, the series is in need of a little shaping up. With “X-Men: Days of Future Past”, the director of the first two installments, Bryan Singer, steps back behind the camera and adapts one of the most acclaimed comics to ever be graced with the X-Men name. “Days of Future Past” finds two generations of mutants teaming up via time travel to stop a cataclysmic war that will be the end of their species and possibly mankind. This gives us the opportunity to see Wolverine (Hugh Jackman), Charles Xavier (Patrick Stewart) and Magneto (Ian McKellen) teaming up with the cast from Matthew Vaughn’s “First Class” film. 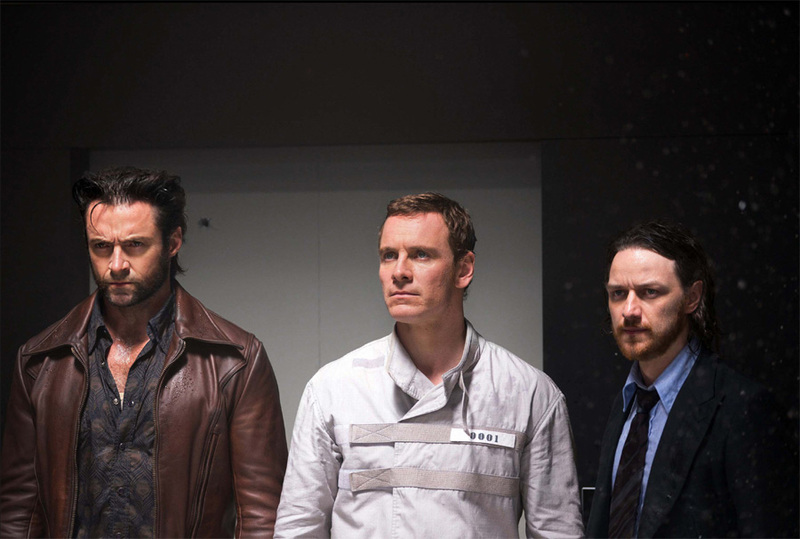 Given the broad nature of the film, there are many cameos, but the notable characters from the past include Beast (Nicholas Hoult), Mystique (Jennifer Lawrence), Quicksilver (Evan Peters) and a young Charles (James McAvoy) and Magneto (Michael Fassbender). After his mind is sent back to his 1970’s body, Wolverine must find the X-Men and bring them back together after the events of “First Class” and the Vietnam War sent them their separate ways. Their main mission involves Dr. Bolivar Trask (Peter Dinklage), a man who fears mutants and has gone to great lengths to build robots called Sentinels that could one day wipe out the mutant population. One of the best things about “First Class” was allowing us to see McAvoy and Fassbender play out the younger versions of Charles and Magneto, characters that had been so iconic. Fassbender was especially great in the role and here he delivers again. The best addition to the film is Peters as Quicksilver. Though he’s only in about 1/4 of the film, his scenes are the best stylistically and give the film a healthy amount of playfulness. It should be interesting to see how Aaron Taylor-Johnson plays the role in Marvel’s Avenger series, but, in this universe Quicksilver is a scene-stealer. “Days of Future Past” not only has a massive time travel story to work with, but the film also tries to right a few wrongs from Brett Ratner’s abysmal “X-Men: The Last Stand.” While I won’t spoil those details, they certainly improve the worth of this film. Though I really enjoyed the film, there were a few things that kept me from absolutely loving it. One, Jennifer Lawrence is completely uninteresting as Mystique. It hurts to say, but J-Law really doesn’t seem right for the part and the character has lost almost all of its edge from the original trilogy. This is especially unfortunate as the character plays a large part in this story. Also, the finale of the film is a little anti-climactic. Instead of a big fight scene, it’s basically a telepathic conversation between Magneto, Mystique and Xavier. Between Quicksilver pulling a jailbreak, a ton of cameos and the apocalyptic future depicted, there are a lot of cool things to like about “Days of Future Past.” As with all superhero movies these days, stick around after the credits for a preview of what’s next for the franchise. Long before Matthew Broderick was running from baby Godzillas in Madison Square Garden, the King of the Monsters built up an impressive filmography spanning decades. One of the biggest pop culture symbols in both Japan and the United States, it was only a matter of time before the franchise was rebooted. In this new introduction of the creature, Godzilla faces off against a pair of monsters that look like the lovechild of the “Cloverfield” monster and an arachnid from “Starship Troopers”. 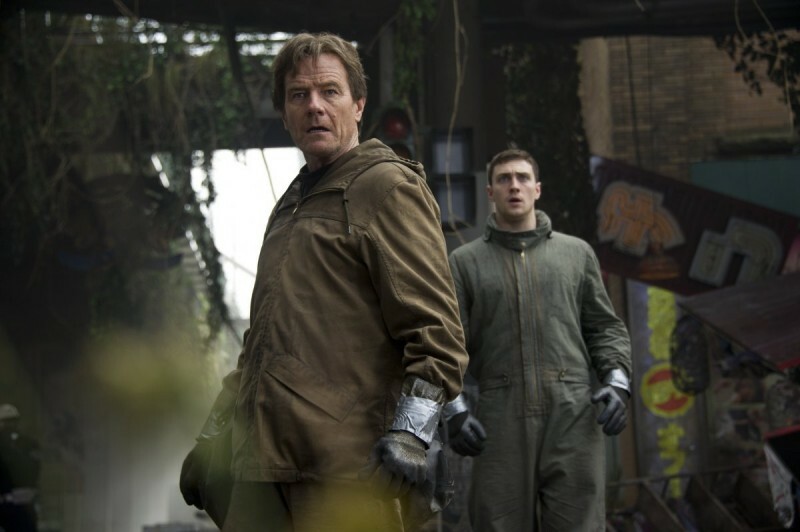 Presenting the human side of the story is the Brody family: the scientist father, Joe (Bryan Cranston), his soldier son, Ford (Aaron Taylor-Johnson), and Ford’s wife, Elle (Elizabeth Olsen). After a nuclear disaster destroys Joe Brody’s family and occupation, he sets out to discover the mystery behind the incident. At the same time, Dr. Ishiro Serizawa (Ken Watanabe) is investigating a giant crater in the Philippines which reveals the tomb of a giant predator and some not-so-dead parasites. Fifteen years after these discoveries, the creatures come to life and it’s up to Godzilla and, to a much lesser extent, Ford Brody to save the world from annihilation. After Roland Emmerich’s 1998 “Godzilla” essentially killed the franchise for American audiences, it was going to take a director with a little more artistic integrity to ever revive the series. Enter Gareth Edwards, whose 2010 “Monsters” lit up sci-fi fans with possibilities using only $800,000 for a budget. Edwards is a true fan of the genre and here he tries to treat the material with reverence (possibly too much). Unlike last year’s “Pacific Rim”, “Godzilla” doesn’t like to have a lot of fun. Since most summer movies seem to come down to Marvel vs. DC anyway, let’s just put it in those terms: “Pacific Rim” is light and funny like Marvel, whereas “Godzilla” has the color palette and seriousness of Nolan’s Dark Knight trilogy. That being said, “Godzilla” provides plenty of entertainment. You may only get a laugh in your theater the first time Ken Watanabe says the creature’s name, but the film provides plenty of spectacle with its action sequences. The creature’s design is a good marriage of realism and coolness and the evil monsters are equally interesting. Watching them go head-to-head in San Francisco is the kind of thing summer movies are made of. One thing that is sure to annoy people is how Edwards will pull away from some of Godzilla’s earlier fights scenes. Instead of seeing these firsthand, they are mostly shown through news reports on the TV. Not exactly what you want to see after a really good buildup. Bryan Cranston is every bit as good as everyone imagined he would be in the part, but Aaron Taylor-Johnson leaves a little to be desired. As the main hero of the story, he’s okay, but someone with more charisma and emotional range might have made the human element interesting enough to cut away from the creatures, as the film often does. Though it’s not exactly the best script ever, these actors, as well as supporting cast like David Strathairn, lend a little credibility to the story. Though it may not crack the Top 5 for Summer 2014, “Godzilla” is worthy of its brand and introduces a compelling story to a new audience. I look forward to seeing which direction Edwards takes the film with its inevitable sequels. In a summer filled with superhero films, nobody wants to be the low guy on the totem pole. While it remains to be seen where “The Amazing Spider-Man 2” falls on that list, it certainly won’t be taking the crown off of “Captain America: The Winter Soldier”. After the reboot that few wanted back in 2012, it seems even fewer were interested in Spidey’s latest outing. The sequel finds Peter Parker (Andrew Garfield) and Gwen Stacy (Emma Stone) graduating high school and continuing their romance from the first film. More comfortable in his role as the protector of New York City, Parker is the web-slinging, wise-cracking hero we’ve come to know from the comics. When Oscorp employee Max Dillon (Jamie Foxx) receives an extremely lethal dosage of electricity, he becomes the villain Electro. Made of pure energy, his only mission is to make the world notice him in a way that it never did when he was a normal human. At the same time, Peter’s best friend, Harry Osborn (Dane DeHaan), returns home from boarding school to visit his dying father (Chris Cooper). Assuming his role at the family business, Harry is lured to the same morally questionable projects that plagued Peter’s father. The cast’s material? Eh, not so great. When Foxx’s villain declares “It’s my birthday, time for me to light my candles,” you start to wonder if Arnold Schwarzenegger’s Mr. Freeze character has a writing credit. Also in the “just a little too campy for comfort” category is Paul Giamatti’s Aleksei Sytsevich, also known as the Rhino. A heavy portion of the film is influenced by the presence of Electro, including an excessive use of dub-step and CGI. Of course any film about a web-slinging superhero will have a lot of CGI, but given the nature of Electro, most of the action sequences are reduced to Spider-Man dodging electric bolts rather than the hands-on fights with Lizard or Doc Ock from the past. 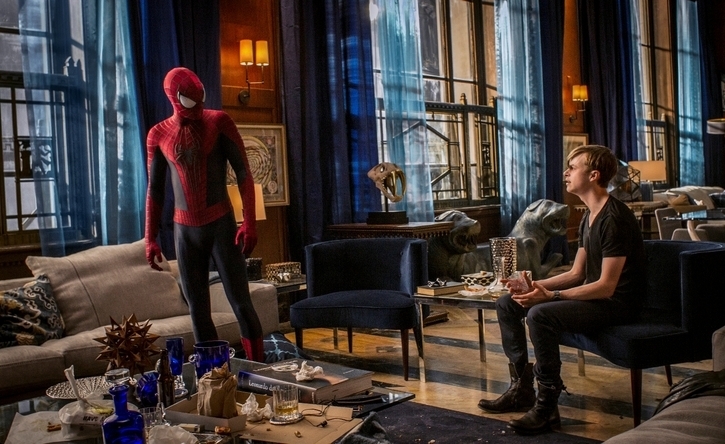 “The Amazing Spider-Man 2” is a flawed film, but where it excels is with its characters. Anchored by a collection of strong performances and some unique visuals, the film stands as a suitable bridge between the first film and the event the 3rd will (hopefully) be.